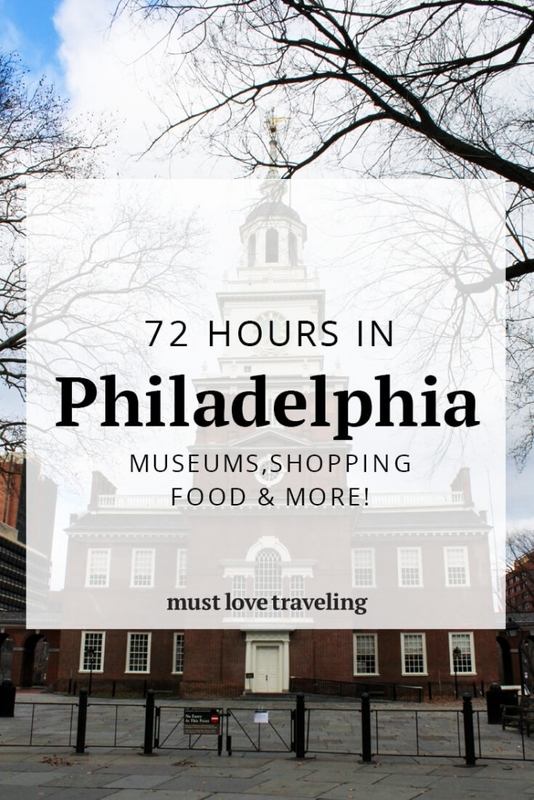 Do you have 72 hours in Philadelphia? 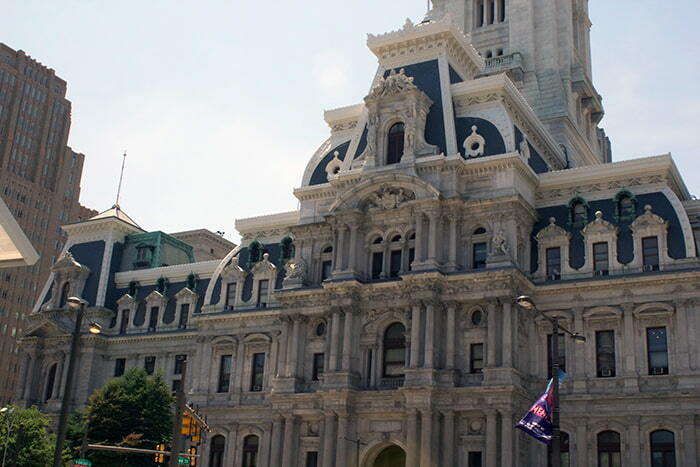 We put together some of our top attractions, restaurants & bars in the Center City area. Some of these will be tourist spots, but if this your first time visiting Philadelphia you have to do the touristy things once right!? We love Philadelphia! We both are very proud to call this our hometown. With that being said, we are always exploring this city looking for new cool attractions, restaurants & bars. Philadelphia is a very walkable city You don’t need a car if you’re only visiting the Center City area. Parking in Center City is always a challenge and takes awhile to get comfortable driving down the small streets. You will immediately notice how small our blocks are compared to other larger cities like NYC. We even had our friends from NYC say this when they visited us the first time. This is actually a good thing because it makes it very easy to navigate on foot and explore more of the city without getting too tired. If you’re into photography, Philadelphia will be a huge playground for you! 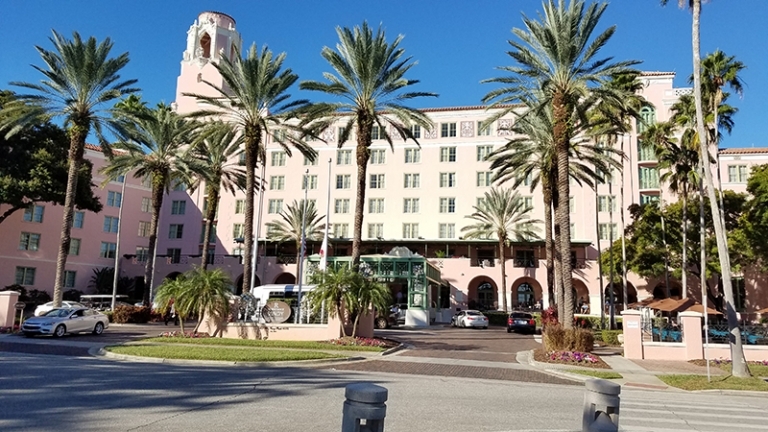 We have some of the most iconic streets and attractions. One of our favorite things to do is stroll down side streets and capture cool shots of murals or homes. You will notice Philadelphia has tons of murals throughout the city, due to our Mural Arts program. The city even offers public and private tours, allowing you to see the murals throughout the city. Use this interactive Google Map to help you follow along and plan out your day. It’s broken out in 3 days, color coded for each day, and organized it so you can explore most of Center City area in 3 chucks. Make sure to click the full screen button to open the map in a new window, this is really helpful if you plan to use this map with your mobile device. Note: The restaurants we recommend on the map are places we often visit and love. There’s a lot of really wonderful restaurants in the city, but we won’t ever recommend a place we haven’t visited. Below is a breakdown of each day. We will list our top attractions for each day and our top restaurants/markets in that area. Day 1 will be the tourist day! Old City is filled with all the major highlights like Independence Hall, Liberty Bell & Museum of the American Revolution. Since this is the most touristy spot in Philly, there will be the occasional solicitor. Just be on alert and pay attention like you would visiting any major city. Since this area is touristy, some of the restaurants in this area will have higher prices than the rest of the city. We will give you a few of our favorites that are cost friendly. 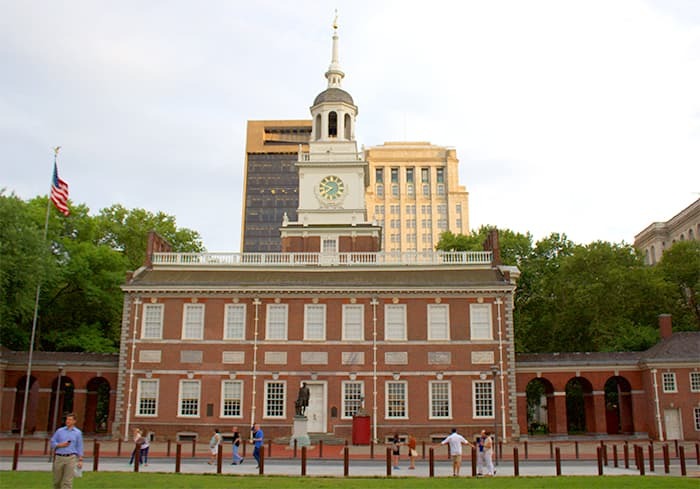 Independence Hall is the birthplace of America. The Declaration of Independence and U.S. Constitution were both debated and signed inside this building. You will get a free group tour of the Assembly Room & Courtroom of the Pennsylvania Supreme Court. It’s really amazing to see the exact spot where the Declaration of Independence and U.S. Constitution were signed. The tour guides are great! Some of them add some humor to their talks and interact with the group. We have had a different experience every time we have visited Independence Hall. 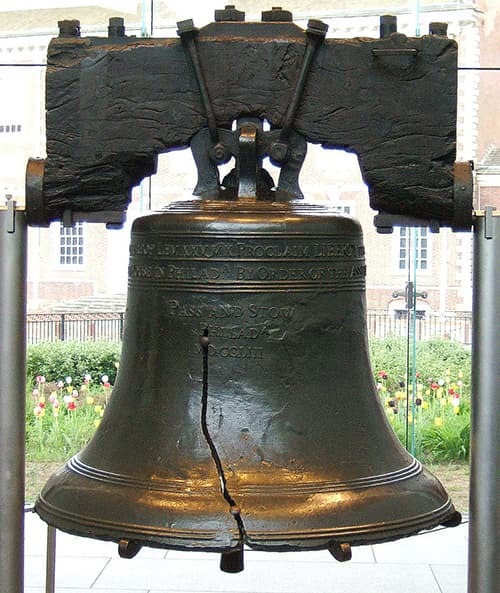 The Liberty Bell is located across the street from the Independence Hall building. Visiting the Liberty Bell can sometimes take a while because the line gets backed up from the security checkpoint. Tip: You can bypass the long line and see the bell in the back of the building through a glass panel. You won’t be able to get close to the bell, but you can at least see it and take a photo. Seeing the bell is pretty underwhelming, it’s not worth much of a wait. I wouldn’t recommend waiting more than 10-15 minutes to see it. Unless this is a major highlight for your trip, then enjoy it from close up! 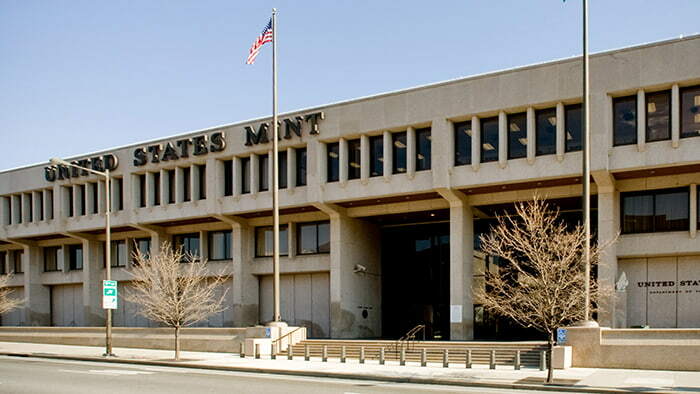 Taking a tour at the Mint is a must do if you’re in this area. You most likely have some coins that were created in this building. Any coin you have that has the letter “P” on the coin means it was created in this building. Each day they make a different coin. For example the first time I went they were making dimes, the last time I took my niece, they were making quarters. Note: They are only open Monday – Friday from 9 a.m. to 4:30 p.m. and closed on federal holidays. 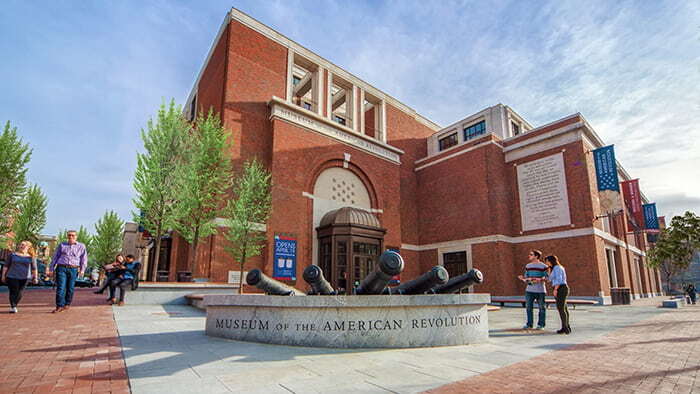 The Museum of the American Revolution is our newest museum and is a great addition to Old City. 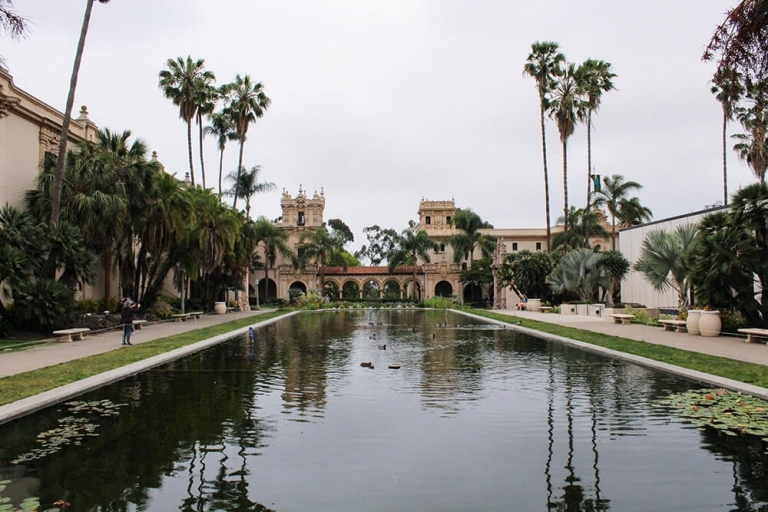 It’s 118,000 square feet and full of art, manuscripts and printed works from the Revolutionary Period. This museum is kid friendly and has tons of cool interactive exhibits. The major core exhibit is George Washington’s Headquarters Tent. This 12-minute feature plays on the hour everyday, with a final showing fifteen minutes before the Museum closes. The Bourse is a newly renovated indoor market with 30 food & drink vendors. This place is a great lunch spot because it really has something for everyone! It’s nice to see this market come back to life since it’s been closed since 2016. Tip: They have nice bathrooms that aren’t crowded! Han Dynasty is one of our go-to restaurants in Philadelphia. This Chinese restaurant is ran by owner Han Chiang. We are lucky enough to live walking distance to the Manayunk location. 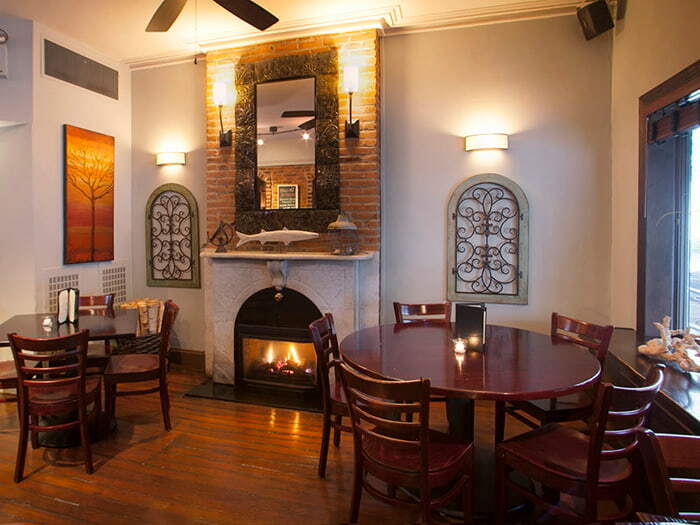 But the Old City location is our favorite because of the interior and atmosphere. They currently have 9 locations throughout PA, NJ & NY. We highly recommend the Dumplings in Chili Oil & Dan Dan Noodles. The first time I tried the Dumplings in Chili Oil, I knew this place would be good! We have been several times and haven’t had a bad meal. This day will be the most walking, but there’s so much stuff in Center City, that you won’t even notice how much you walked. 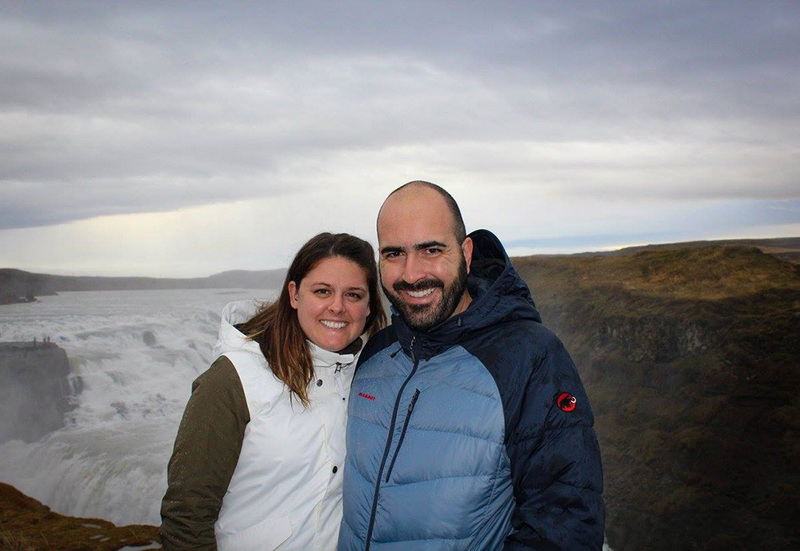 We used to live in the area and still enjoying visiting, as some of our favorite restaurants & bars are located here. Day 2 will give you a fun day of shopping and sightseeing. City Hall is located in the middle of the city. It’s a very iconic building that is full of history and fine details. It was completed in 1901 and is still being used. Fun fact, we got married inside! There’s events that are setup at the base of the building at Dilworth Park year round. In the winter time, they setup an ice skating rink and a huge Christmas market that expands to Love Park. Make sure to snap a photo across the street at Love Park. Tip: You can take a cheap tour in the tower, this will give you some really nice panoramic views of the city from 548 feet. Not a lot of people know about this tour, so it’s normally not packed. Check out this link (City Hall Tower Tour) for information. This is a great hidden gem right in the middle of the city! It’s a nice place to view art for a couple of hours without the crowds. Make sure to check out the airplane street art outside the museum. Seeing this crashed fighter jet in the middle of the city is a very unique experience. There’s also a little greenhouse inside! 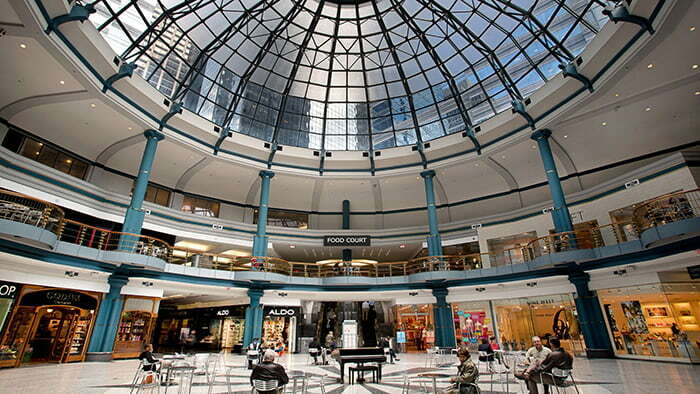 The Shops at Liberty Place is in the middle of the shopping district in Center City. This is a nice small indoor mall with a food court. There’s 55 shops and restaurants in the building. 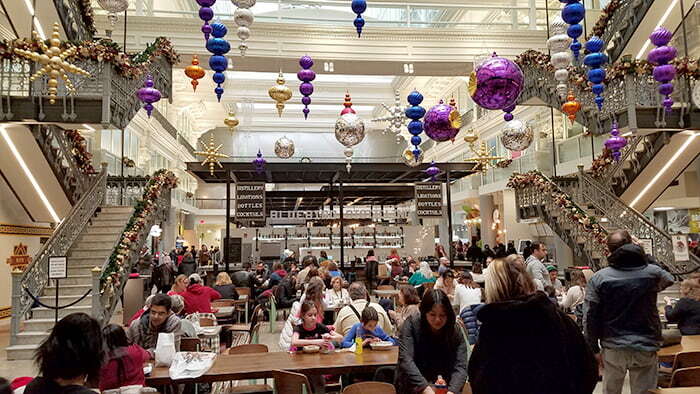 The food court can get very busy during lunch hours during the week, as there’s tons of businesses in this part of the city. It’s a great place to get some shopping done. Tip: This is the only place to get Chick-fil-A in Center City! Rittenhouse Square is one of the nicest public parks in Philadelphia. It’s surrounded by nice restaurants, cafes & retail shops. It’s a great place to relax after walking all day and people watch. This park is filled with all different types of people. You can see families playing with their kids, dogs playing fetch and the random musical performance. 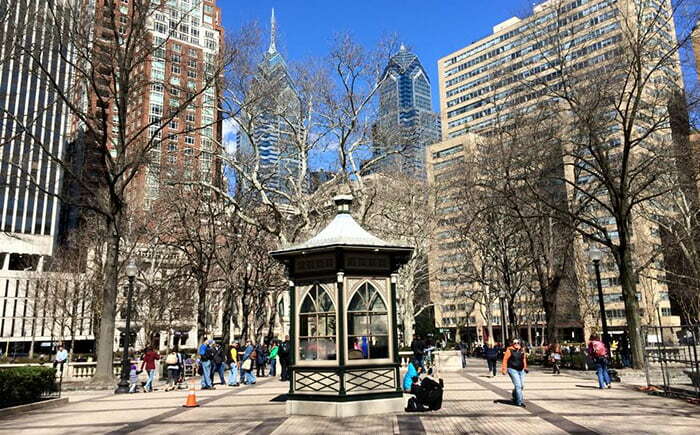 Rittenhouse Square has appeared in several movies. It’s rare but you could be lucky enough and catch a recording production while visiting this area. Reading Terminal Market is a must see! It’s a huge enclosed public market, it has every type of food! 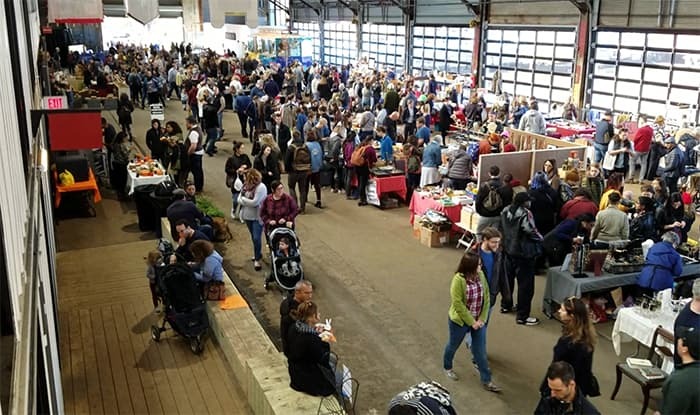 There’s tons of award winning vendors in this market. 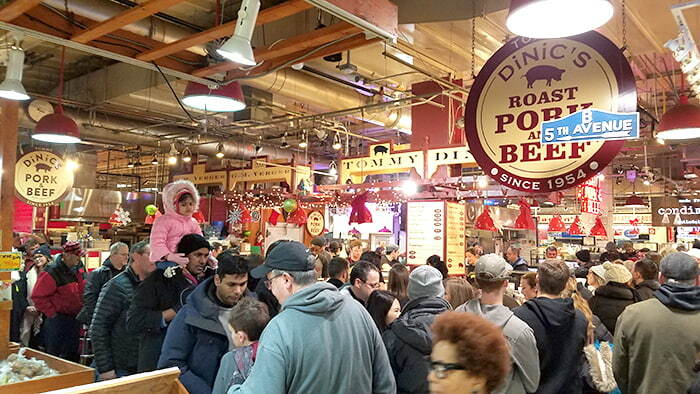 DiNic’s Roast Pork is one of the busiest food vendors in Reading Terminal. Of course, they are famous for their roast pork sandwiches. I sometimes mix it up and get their homemade meatballs. The line can get very long in the lunch hour. We recommend waiting for a seat at the bar if you can and enjoy your food there, you will get great service and don’t have to worry about finding a seat in the center court. Other one of my other favorite things to get in Reading Terminal is a grilled cheese at MeltKraft. They make the best grilled cheese I’ve ever had. Their secret? They make their own cheese! Not only can you get an awesome grilled cheese, but you can buy their cheese from the counter. Reading Terminal can get very crowded (this photo was taken on a Saturday afternoon) on the weekends and during the lunch hour in the week. It’s a big tourist hot spot and a local favorite. Dim Sum Garden is located in Chinatown, so this is might be a bit out of the way. Barbara’s cousin took us to Dim Sum a few years and we fell in love instantly! We continue to visit here when in Chinatown. The menu is huge, but we recommend just ordering off the “small bites” menu. Its got a huge selection of food at a very good price. 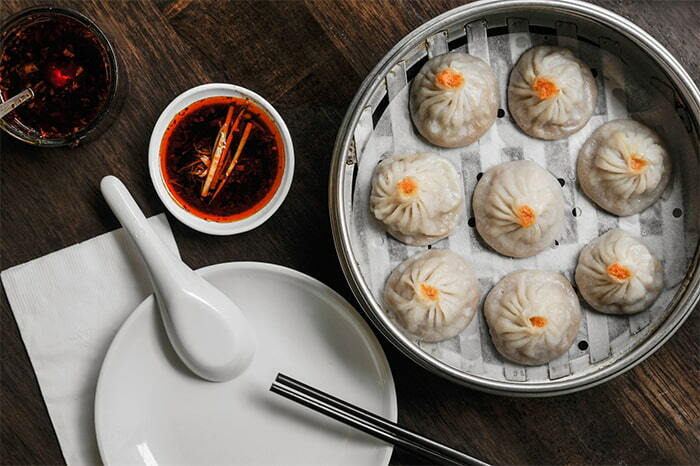 Our 2 favorite things to order are the Scallion Pan Cakes & Soup Dumplings. There’s almost always a line to get into this place, but don’t worry it moves very fast. Even on a busy night, we haven’t had to wait more than 15 minutes. Note: They won’t seat your group unless everyone is present, they are very strict on this rule. This day will be full of some our most iconic museums and you guessed it! The Rocky Steps! Make sure to take some photos looking down Ben Franklin Parkway. It’s aligned with around 90 flags from different counties. The flags represent countries with significant populations in Philadelphia, and are hung alphabetically, with a few exceptions. 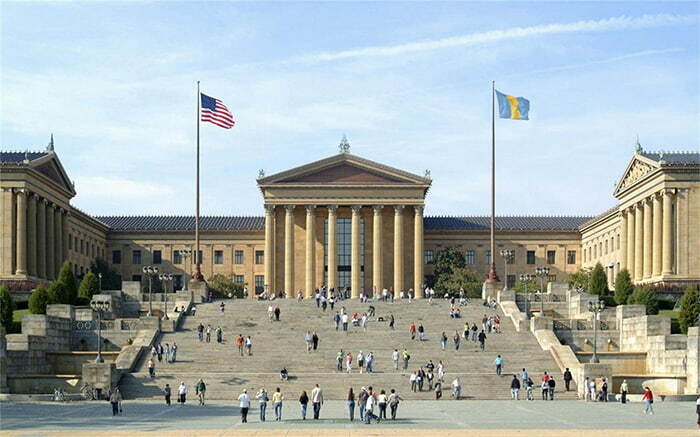 This is a combo attraction, the Rocky statue & steps lead up to the Philadelphia Museum of Art. The line at the Rocky statue can get very long. Sometimes there’s a longer wait to take a picture at the Rocky statue than the Liberty Bell. People love their Rocky! It’s always fun to walk by and see how much fun people have running up the steps. I know I was super excited to do it the first time! Make sure you get a nice photo of the skyline while at the top. If you continue up the next flight of steps, you will be inside the massive Philadelphia Museum of Art. The museum is one of the largest art museums in the world based on gallery space. On average most people stay around 3-4 hours. But you could spend days in here if you like to read everything! 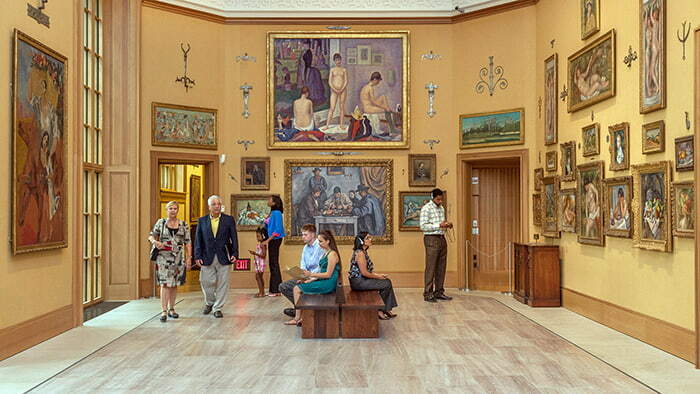 The Barnes Foundation is a huge collection of French impressionist and post-impressionist paintings from Dr. Albert Barnes. What makes this museum very unique is the way he laid out his artwork. He used colors, lines, light and space to layout each room. People travel from around the world to view his collection. The Franklin Institute is our big science museum. It was founded in 1824 and is one of the oldest centers of science education and development in the United States. They offer tons of great exhibits and exhibitions. They always have a big seasonal exhibit, currently it’s the Vikings: Beyond the Legend. One of our favorite things they do is the Night Skies in the Observatory. This is a monthly after hours astronomy event. You will gain access to the roof and be able to stargaze! Even though you’re in a the middle of a big city, you can still get some cool views of planets and a few galaxies. McCrossen’s Tavern is a cozy neighborhood pub. It’s a great place to grab some lunch while visiting the museums. This area doesn’t have a lot of restaurants. If you go north to Fairmount Ave. there will be more restaurants to try out. These are places we wanted to add to the list, but they didn’t quite fit into a daily agenda or are located a bit outside our 3 main areas. You can walk to these locations, but if you’re not used to walking a lot, we recommend using Uber. In most cases it will only cost around $10 to travel from one side of the city to the other. This is a very unique type of museum/tour! This prison was operational from 1829 until 1971. It has since been restored in certain cell blocks for the tour. Some of the cell blocks of this prison were left “as is” because it sat in decay for so long. When you enter the prison you will be given an audio device. You will use this device throughout the whole tour, so it feels like a very personal tour and you can go at your own pace. There’s tons of stories and history to learn while on the tour. 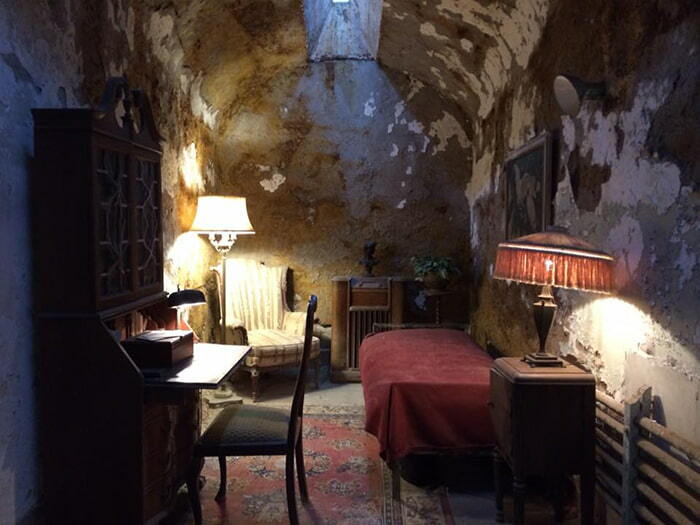 One of the big highlights is being able to see notorious criminal cell of “Scarface” Al Capone (photo above). Believe it or not, but this tour can last several hours. I went by myself before and spent about 4 hours and visited almost every part of the tour. There was still a few more things I didn’t get to see. They also offer small free group tours of select cells throughout the day. There’s postings throughout the prison with meetup times and meetup locations. This is one of the most unique museum’s I’ve ever seen. It’s a very rare collection of medical abnormalities. 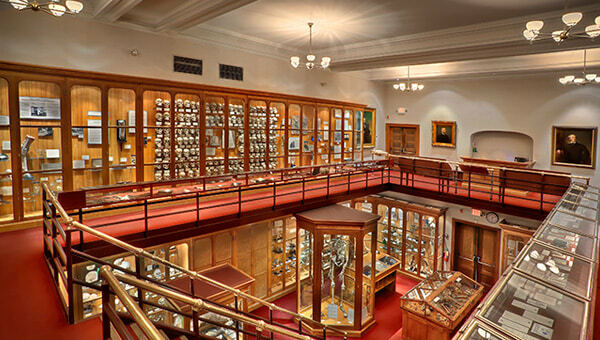 Yes, this museum isn’t for everyone, but if you’re interested in learning about medical history and medical instruments then this museum is for you! I fell in love with this museum the first time I visited Philly. It was actually one of the top attractions I wanted to visit. Since living here I’ve made several visits. I love to take people here for the first time and watch their reactions. Tip: This museum can get very busy on Saturdays, try to visit it early if you plan to visit it on a Saturday. It’s not a very big museum, so it can feel very crowded. 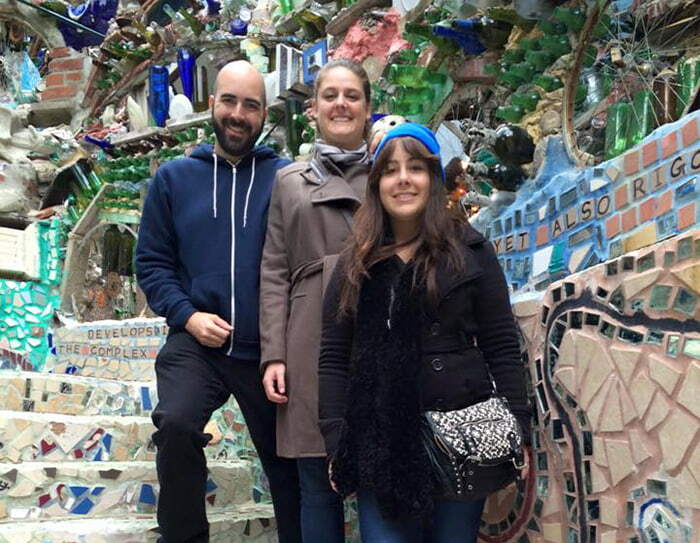 The Philadelphia Magic Gardens is an immersive mixed art environment that is covered completely in mosaics. The creator, Isaiah Zagar, used handmade tiles, bottles, bicycle wheels, mirror, and international folk art to chronicle his life and influences. This place has turned into a huge Instagram hot spot. It’s almost now required to purchase tickets in advance. This is the newest year round mixed-use public space in Philadelphia. It opened in October 2018 after sitting vacant for many years. The most attractive thing about this market is that it’s open 365 days. This is great news for those really cold or rainy days. There’s a few concessions that sell local food and drinks, sold out of historic trolley cars. The back of the building has a nice open-air garden. This is a great place to relax and have a drink and overlook the Delaware River. We both agree that this is our favorite restaurant and best we have ever had! We went last year for our Christmas date night and we left the restaurant very happy and full. Zahav is one of Philadelphia hottest restaurants and it can take months to get a reservation. The restaurant is owned and ran by Chef Michael Solomonov, a celebrity chef and James Beard Award winner. You might be able to see him work at the bread station. This restaurant is on the pricey side, but it’s totally worth it, as it’s one of those meals that you will never forget! 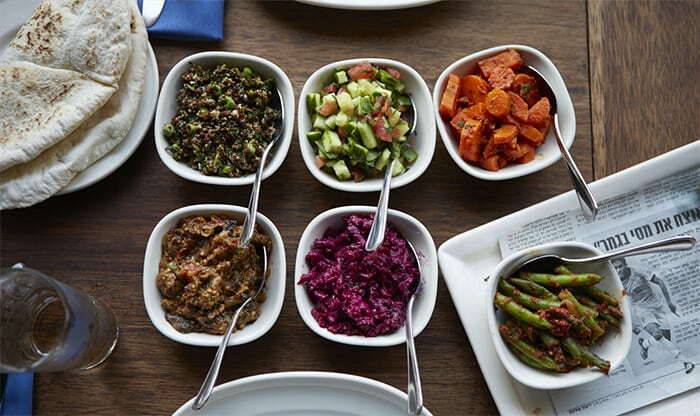 We recommend getting the “Taste of Zahav”. This will give you tons of smaller dishes to try so you can really get the full experience of their menu. If you’re visiting and don’t have a reservation, it’s possible to get a seat at the bar, but it’s very hard, because the bar isn’t very big and people tend to stay a long time. 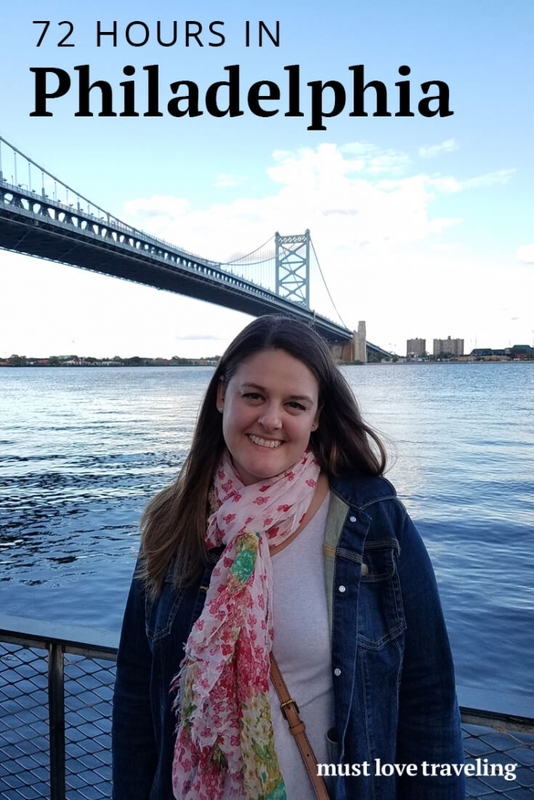 Planning to spend 3 days in Philadelphia? Use this 72 hour guide, written by a local, to help you get a feel for all the city has to offer! Thanks, we are glad you found it helpful!